The Everton boss says you “can’t teach” the qualities that the Irish international possesses. Seamus Coleman has been in fine form this season. 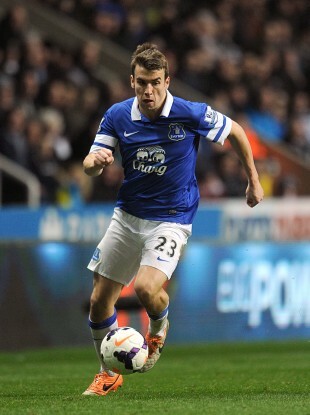 EVERTON MANAGER ROBERTO Martinez has endorsed full-back Seamus Coleman as one of the best at his trade. The former Wigan boss has guided the Goodison Park outfit to within touching distance of the UEFA Champions League, as they trail fourth-placed Arsenal by one point and have a game in hand. Martinez said Coleman’s output this Premier League term has buoyed Everton, with the Irishman netting six league goals from defence. “It’s that good arrogance – the footballing arrogance,” Martinez said. “You can’t teach that. Seamus has had that for a long, long time — being able to express himself like that on top of all his duties and the responsible things he has to do for the team. “Seamus is a good example of a footballer with an incredible attitude and appetite for the game. Martinez said his coaching has not influenced the 23-time Ireland international, with Coleman excelling in defence after making the switch from the wings. “I haven’t done anything to coax that out of him per se,” Martinez said. “He knows his potential. He plays in a demanding position which needs you to be so good in many areas. Martinez was not resting on his laurels after their significant 3-0 home win over Arsenal, which put their European destiny in their own hands. “We all know that it’s difficult to get perfection in football terms. There’s always slight margins for improvement,” he said. Email “Seamus Coleman one of the best full-backs in the world - Roberto Martinez”. Feedback on “Seamus Coleman one of the best full-backs in the world - Roberto Martinez”.